To save Venezuela: what was the goal of Maduro’s visit to Baku? Venezuelan President Nicolas Maduro is the first Latin American leader to have ever visited independent Azerbaijan. Experts say that the key goal of Maduro, whose country is suffering from falling oil prices, was to convince Azerbaijan to join the oil output freeze initiative. But was it worth for Maduro going such a long way for convincing a country that has so far welcomed all of OPEC initiatives? Besides, Azerbaijan does not produce enough oil to be able to influence the global output. While Maduro was visiting Baku, his opponent, Governor of Miranda Henrique Capriles urged his supporters to organize a big protest action on Oct 26, the day when the Venezuelans are to vote on Maduro’s dismissal. Azerbaijan was the first country on Maduro’s tour, the next being Iran, Qatar and Saudi Arabia. The Venezuelan leader wants to be sure that all of them are committed to OPEC’s preliminary agreement and are ready to freeze their oil outputs. On Nov 30, OPEC producers are to reconsider this problem but most experts doubt that they will reach a consensus. The United States and some other developed economies are not interested in high oil prices, with Iran and Russia having special positions on this matter. Azerbaijan produces just 0.5% of all oil in the world, so, Ilham Aliyev’s promises to freeze his country’s oil output sound absurd or this may be just a politically-motivated step in the face of a growing crisis. Aliyev’s contacts with Venezuela are part of his strategy to intensify its activities in Latin America. As a result, he has convinced the parliaments of Columbia, Peru, Panama, Honduras, Paraguay and Guatemala to condemn the tragedy in Khojaly – events that are qualified by Azerbaijan as a genocide committed in occupied territories around Nagorno-Karabakh. Some sources say that one more goal of Maduro’s visit was to get some investments. During his meeting with Azerbaijani Prime Minister Artur Rasizade, the Venezuelan president said that his country was interested in enlarging its economic contacts with Azerbaijan and in exploring opportunities for mutual investments in energy projects. But Aliyev is well aware that Venezuela is facing both economic and political instability. So, Maduro’s major concern today is to find ways to save his economy. But obviously it is a risky venture to invest money in such an economy. Besides, Azerbaijan is not rich enough to be able to revive Venezuela’s economy. Even wealthy China is not going to take such a risk. 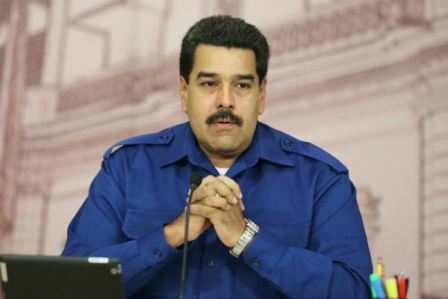 In Baku Maduro said that he had a formula that could stabilize oil prices for 10 years. At first, he is planning a short-term freeze (for some six months) and then he suggests developing a mechanism that would stabilize oil prices for years. Maduro’s key goal for this tour was to sign agreements that would help him to stabilize the oil market and to save his own economy. The Venezuelan president is one of the most ardent advocates of high oi prices as they can help him to pacify his hungry people. So, he keeps suggesting ideas on how to revive the prices. Now he has a new idea and he is going to make it known to the major oil producers. And Azerbaijan was the first on his list. Turan News Agency has noticed one more important detail here. Aliyev’s regime is adopting some of the measures used by Maduro and his predecessor Hugo Chavez in fighting the opposition, controlling prices and diversifying the economy. Aliyev’s decision to institute the office of Vice President was a copy from similar Venezuelan practice. Maduro himself won presidency as Vice President by just a 1% margin in a very disputable race. His last decision to appoint a new Vice President is a guarantee that his regime will be continued. It means that even if the opposition manages to dismiss him next year, the country will be ruled by his man. Experts are convinced that Venezuela is facing a collapse. They have been expecting it for years but today consumption in Venezuela is slumping, with most of the Venezuelans already suffering from hunger. Ordinary people are trying to make both ends meet, the authorities are trying to do something but in vain, the opposition is trying to find those guilty and all of them together are just trying to survive. Venezuela is a complicated country. So, you will hardly find anybody who would venture to predict its future, will you?